Born at Besancon, France, on 19 October 1862, as a young man Auguste worked with his brother Louis to establish the success of their father Antoine's photographic materials factory. 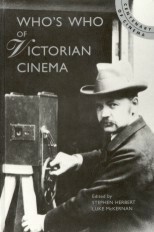 He was later involved in the development of the Cinématographe; while Louis was chiefly responsible for the mechanism, Auguste arranged for Alfred Molteni (leading manufacturer of projection lanterns) to make the necessary lamphouses. At the Congres des Sociétés Francaises de Photographie in July 1895, Auguste filmed the Congress members disembarking at Lyon, and a conversation between astronomer/photographer Janssen and Consul-General of Rhone, M. Lagrange; on the projection of the film the next day, both subjects delivered their lines 'live' from behind the screen. Auguste appeared in several of the early films himself, directing the activity in Démolition d'un mur and, with his wife Marguerite and daughter Andrée, enjoying the role of family man in the proto-home movie Repas de Bébé, and again with young Andrée in Pêche aux Poissons Rouge. Even while he assisted Louis in the exploitation of the Cinématographe, Auguste's interests were focused on research in medical and related fields. He was the first in France to set up a working X-Ray machine. In 1910 he set up a laboratory in Lyon employing 150 workers, and with departments of chemistry, physics, 'histologie', 'serologie' and analysis - and a research library of 30,000 volumes, where he worked on tuberculosis and cancer. 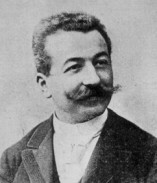 Auguste Lumière died on 10 April, 1954 aged 92. Much feted by a grateful France, the Lumière brothers appeared on several commemorative postage stamps and medallions. In 1995 however, plans to feature them on the 200 franc banknote were cancelled as the presses were rolling, following new sensitivity about their activity in the Vichy regime of the Second World War.